The first batch of this jelly-like jam was sweet and hot, delicious. The second batch was spiced, half with star anise and half with cardamom, tastes and aromas of a holiday season. The third batch – winner! – was laced with a dab of chipotles in adobo sauce. Sweet and hot, and smoky. And that was BEFORE I went to San Francisco for a week, visiting the legendary Ferry Plaza Farmers’ Market on a Saturday. Wow. I stopped in to the booth of a farm that specializes in chilis, and makes multiple types of pepper jams. Next time (maybe this coming weekend), I will try cooking a wider variety of peppers, reducing them to a thick sauce with vinegar and sugar (less than used for this jam), adding powdered pectin (OK, I succumbed) at the very end. Or maybe not if the mixture will become a sauce. 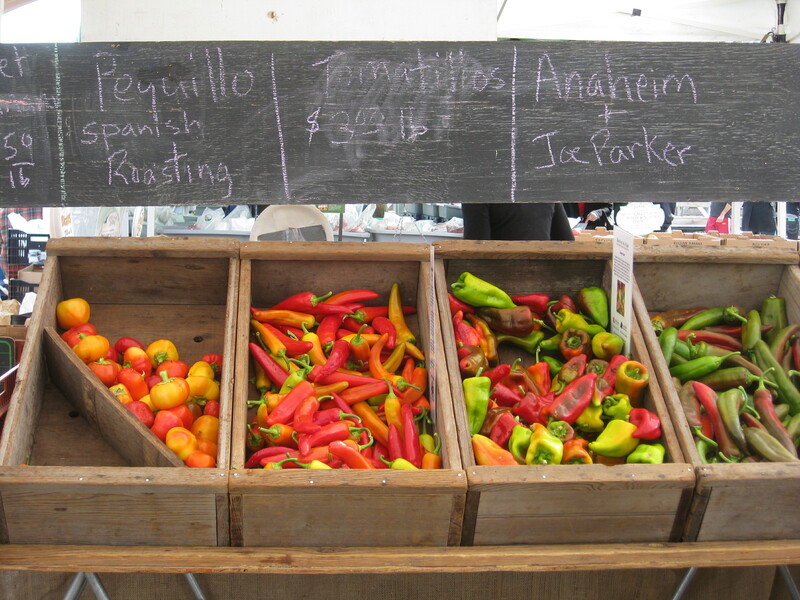 Before California, excited to see that the Tigress’s October Can Jam would focus on capsicums – peppers of all types – I gathered up all of the red ones from our CSA farm, my own little in-town garden, and a couple of varieties of hot ones from a nearby farm stand. It was a guess as to how hot the jelly should be since pepper seems to calm down after being canned. (I found that out the hard way after I wimped out on some peach salsa earlier this summer.) While I normally look for ways to use homemade pectin when the ingredients don’t have enough of their own, I followed Pam Corbin’s advice (in the American version of her River Cottage Handbook) and added powdered pectin. This is going to be great during the holidays. I can see it now… spooned over baked brie, spread on homemade crackers with a little cream cheese or ricotta. Or… garnishing a root vegetable soup. One of our guests at a dockside dive in California had a sustainably fished trout for dinner, which was garnished with an almost identical pepper jam from South Carolina… nice counterpoint. This one’s a keeper. Prepare the peppers. Remove the seeds and ribs, taking care with the hot peppers not to touch the flesh too much, and certainly don’t touch your eyes after you’ve been handling peppers since the oils will burn you. 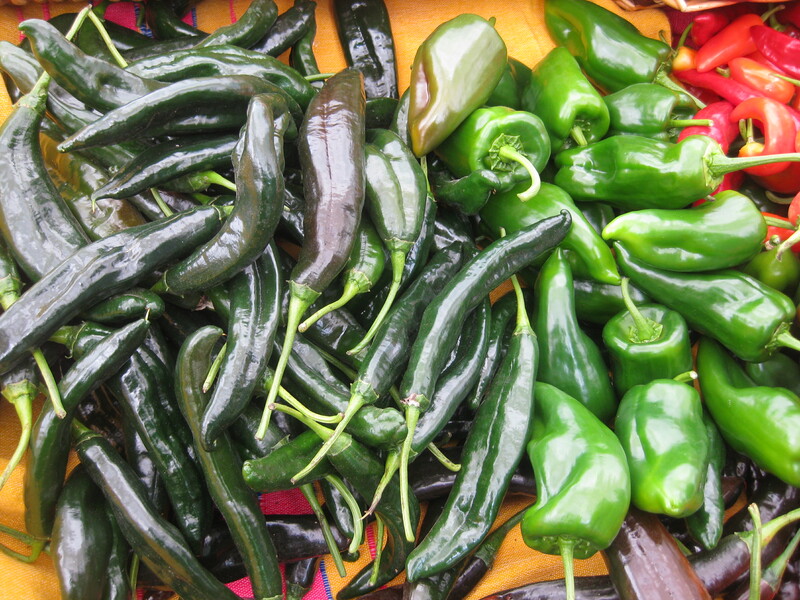 Wear rubber gloves when handling numerous hot peppers or use a sharp knife and sharp-tined fork, my preferred method. Cut them into chunks and place them in a bowl of a food processor. Pulse to chop finely but don’t liquify them. Finely mince the ginger (you can add this to the peppers but cut it finely first since its harder texture will cause it not to chop to the same consistency as the peppers). Prepare jars and lids for canning (I used 4 oz jars but 8 oz/half-pint would be fine). When ready, reheat the jelly/jam to a boil and spoon into the jars. 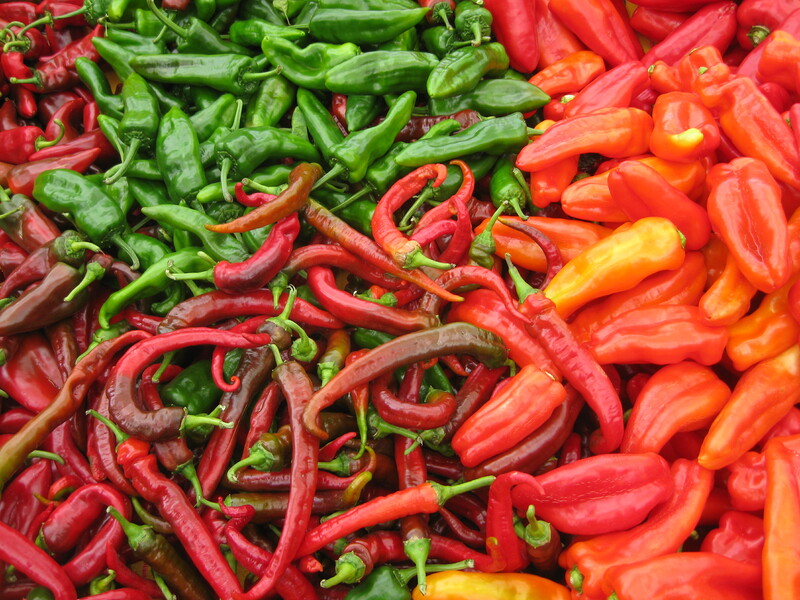 If the peppers are not well distributed in the liquid, let the mixture sit for a few minutes and stir. Process in a water bath canner for 10 minutes after the water comes to a boil. Remove the lid, turn off the stove and let the jars sit for 5 minutes before removing to rest undisturbed until cool. Makes up to eight 4 oz jars. Of all the exciting new recipes I found this year, this is the one I’m most taken with. 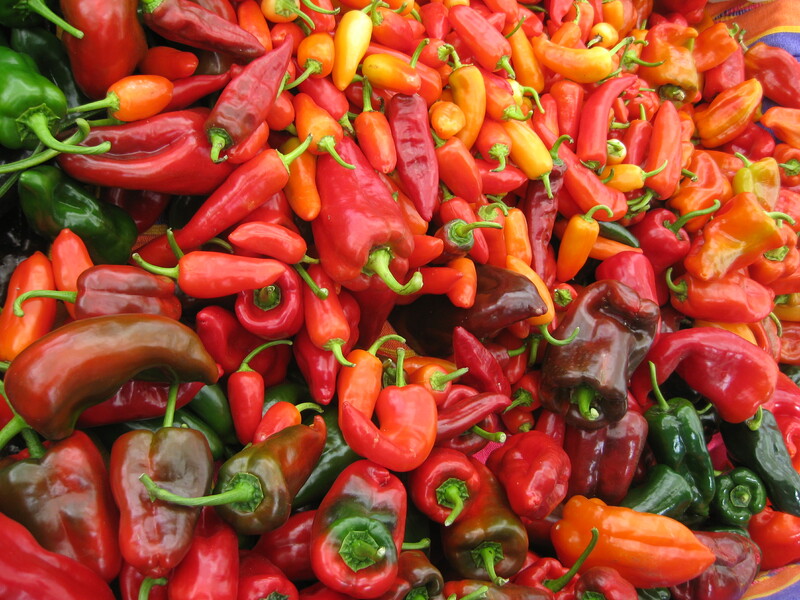 We grow a lot of peppers and last year we were swimming in them, I must have made gallons of roasted pepper soup. This year I had just enough to try this recipe. This is a keeper – I can’t wait to try another batch! It’s one of my favorites too. I already made one batch, with a dab of adobo sauce and will make at least two more, one with spices and the other plain. So I caved and actually bought some peppers so I could make more of this jam (most everything we can is produce from our garden or gathered wild in the woods). I wanted to try it with cardamom (my favorite spice!) How much do you put in? I went with a teaspoon and it tasted pretty good before it went in the canning jars. I haven’t tried the star anise yet, my husband’s extensive spice drawer does not (yet) include that. Might have to send him off to Penzey’s (again) to get some! Hi Juli. 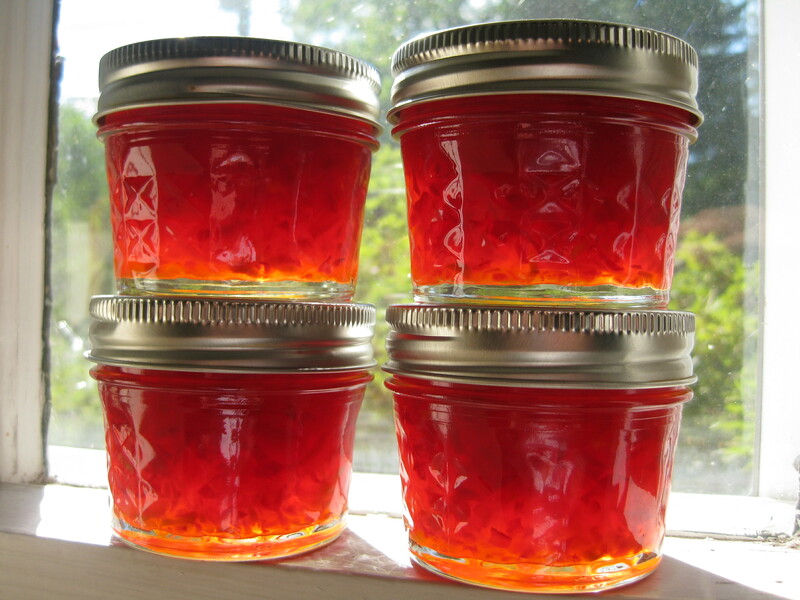 I’m canning another batch of this jam this weekend too, with the last of our hot red peppers. I made a full batch two weeks ago with star anise and cardamom. I used the black seeds from 4 whole pods of green cardamom, lightly crushed, and one whole piece of star anise. I’m lucky that I can buy good spices in bulk – but in tiny amounts — so I rarely go to a source that packages in such volume as Penzeys. I’ve been to one of their stores, which was amazing. I let the mixture sit for a bit after cooking so that the gel would allow the pepper pieces to float nicely. I left the spices in the mixture to steep and removed the star anise before processing. I could have used more spice, but I knew that the little seeds would continue to impart their flavor for months. Just had to tell you your jam was the star of the Thanksgiving dinner tonight! My husband made a big pot of his curried carrot soup, which is very good. But with a dollop of the jam on top, it was out of this world divine! We didn’t get to take any of it home with us (not that there was much left, my niece must have had 3 bowls by herself). It was so good on crackers with some goat cheese too. Yep, I can see I’ll be making more of this jam! I make this every year, and I sometimes find that I need more pectin too. Mostly, I cook the mixture down so that the internal pectin kicks in before I add pectin. I made green apple jelly this year and I’m thinking about using it as part of the liquid base.